In the 3+ weeks we've been working on this project, I never thought we'd finish before I left for thanksgiving break. I use the term loosely, the skeleton still needs paint and detailing. We'll be bringing it to Tucson, and in the meantime it will be proudly displayed in our marine hall for all to see when they visit the RMDRC. We've been molding quickly.Yhere are a lot of pieces to this critter. Missing bits are being reconstructed based off of our Ichthyodectes cast skeleton. Cast vertebrae are being remolded (this animal seems to have 115-120 vertebrae) and ribs/spines are being manufactured as fast as we can make them. Assembly should begin sometime next week. The fish itself is 13% larger than the famous articulated Saurodon specimen that Marion Bonner discovered, which is at the LACM. A quick bit of scribbly math puts us at a total length of about 8 1/2 feet, with a skull at over 19 inches long. It's a lot bigger than I assumed based on the pile of bones we began the project with. Below is the right dentary, that had damaged/missing teeth in the center. We molded the left dentary and used cast copies of the teeth to reconstruct the missing bits. The more I work with this thing, the weirder this critter becomes. 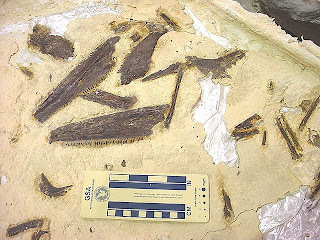 Finally an update on a specimen I discovered back in 2006. 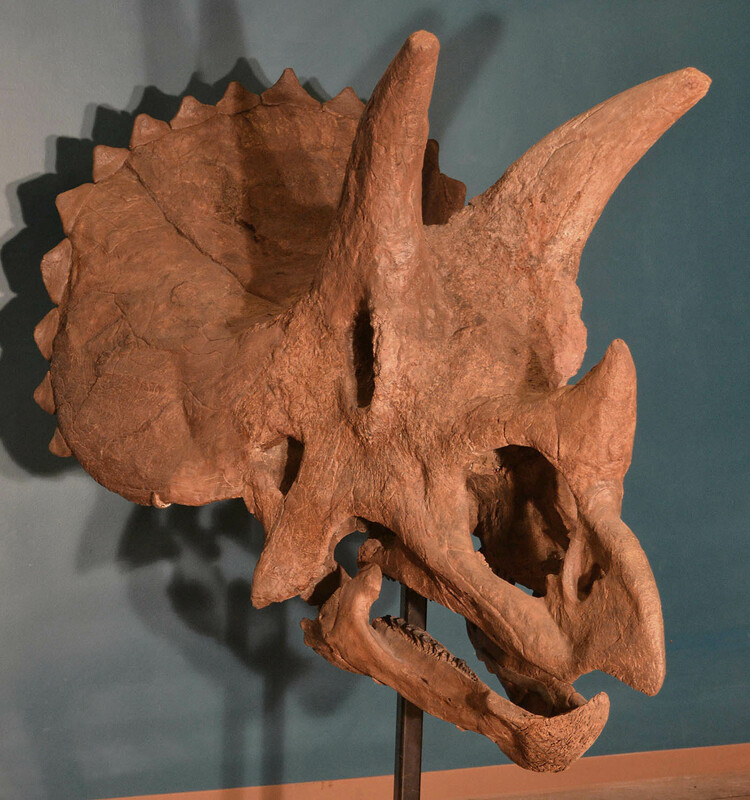 Tony I (named after my father) is a completely exploded Saurodon skull and pectoral fin assembly. Saurodon is an ichthyodectid fish (related to Xiphactinus, Saurocephalus, Gillicus, Ichthyodectes and of course Prosaurodon) that had a peculiar chin spike, in this case over 6cm long. The teeth are like mini flat knife blades. 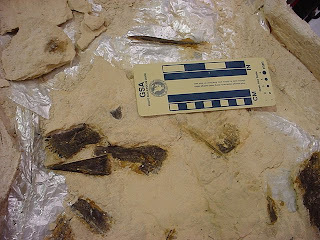 This specimen was discovered disarticulated at about MU 18-19 in the Niobrara Chalk of Logan County, Kansas. The locality is surprisingly high in the Niobrara, I have found several specimens of a later relative (Saurocephalus lanciformis) in the rock layers immediately above this specimen. Below you can see the predentary along with one of the premaxillas. Nasty, but luckily not articulated like the majority of Saurodon leanus specimens in other institutions. No, Tony I looked like it swallowed a hand grenade, kinda like the ending of the movie Jaws 3. That's just how we like to find them. Preparation shows that the majority of the skull is present. The missing bits will be reconstructed based off of our Ichthyodectes ctenodon reconstruction. Be sure to stop by the museum and check in on the project. We hope to have the prototype skull assembled by Thanksgiving!